News News CBC 2019: certainly the right idea! 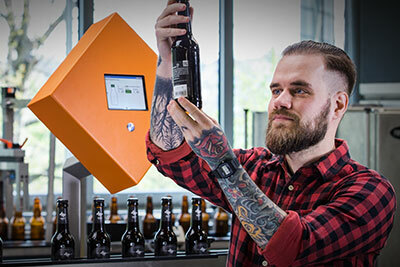 The innovative solutions which HEUFT will be showcasing at the Craft Brewers Conference (CBC) & BrewExpo America in Denver, Colorado, from 8 to 11 April 2019 provide an optimum entry to true high-tech for the in-line quality check and inspection of empty bottles, full cans and trays which have already been packaged. The meeting place for the North American craft beer scene is the ideal platform to share ideas for increasing the quality and performance of breweries. This not only applies to the brewing process but also to the filling and packaging process. And HEUFT has the right ideas to make this safe and efficient. That will be demonstrated by four new and further developments which the leading supplier of in-line systems for quality assurance of empty and full containers will be presenting live on stand 18075 of the trade fair. They provide smaller craft brewers with an optimum entry to state-of-the-art technology on a true HEUFT level and keep pace even when output and line speeds increase. A brand new HEUFT ONE has its trade fair premiere. The full case check is particularly compact like all entry-level devices of the series – and can therefore be easily integrated into smaller filling and packaging lines with little space. It checks immediately after the packer whether the trays which have just been produced are really completely filled with the correct number of beer cans and reliably removes those which are not. This is exactly what the other space-saving HEUFT ONE device for a full container check which can be seen at BrewExpo America within the framework of the CBC accomplishes earlier along the line with underfilled or overfilled and unsealed beverage cans. It combines an X-ray level measurement with inductive sensor technology for checking the lids in order to detect them reliably. In contrast to the HEUFT PRIME full container check with even more functions, even more automation and the audiovisual HEUFT NaVi user guidance which will also be presented live, the HEUFT ONE devices not only detect the faults but also evaluate them directly on the conveyor belt. Therefore the particularly compact control terminal can be positioned in a space-saving and flexible manner practically anywhere along the line even far away from the compact detection units. This means that the compact entry-level devices even fit into the smallest installation spaces! This also applies to the new HEUFT InLine II IR for entry to an empty bottle inspection of the new generation. The proven optics of the highly automated system covers the complete base and finish area of each individual container on an area of just one square metre – as well as over 360° of its sidewalls with a corresponding module in the outfeed. This ensures an all-surface empty bottle inspection (ASEBI) at all times with line outputs of up to 36,000 bottles per hour. Ideal therefore for young craft beer breweries and other SMEs! The modular system simply grows too when output and line speeds increase: the retrofitting of an additional detection unit for a sidewall inspection makes a complete examination of up to 72,000 empty bottles per hour possible. Craft Brewers Conference & BrewExpo America, Stand 18075, Colorado Convention Center, 700 14th Street, Denver, 8 to 11 April 2019.